Growing incidence rate of eye inflammations or uveitis has driven the patients toward adopting effective treatment options. In the coming years, majority of uveitis patients will be seeking ocular inflammation treatments through combination therapies, particularly due to collective effectiveness of therapeutics and prescribed drugs. Leading pharma giant Allergan Plc. has recently cleared its Ozurdex implant from FDA’s uveitis pipeline, and this new delivery system will mark a key development for combination therapies in ocular inflammation treatment. In addition to Allergan, Transparency Market Research also observes high stakes of Novartis AG, Valeant Pharmaceuticals International, Inc., Abbvie, Inc., Alimera Sciences, Inc., Eyegate Pharmaceuticals, Inc., pSivida Corporation, Pfizer, Inc., Cipla Ltd., and Akorn, Inc. in the global ocular inflammation treatment market over the coming years. The report estimates that incidence rate of uveitis in the US and Canada remains to be the highest. 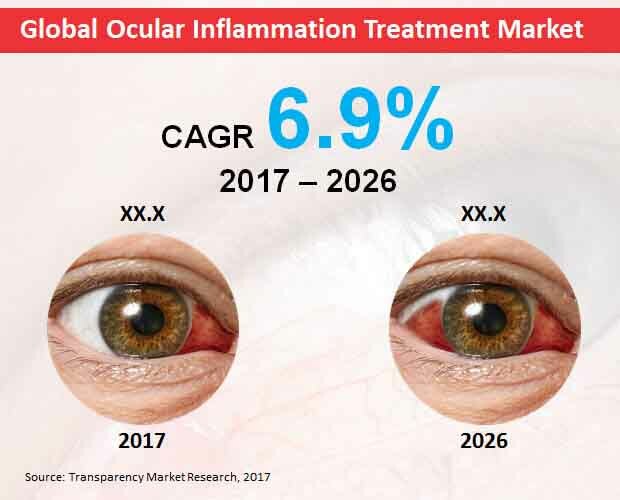 Over the forecast period, North America will be observed as the world’s largest ocular inflammation treatment marketplace. It is further estimated that treatment of anterior uveitis will be predominant, considering it being the world’s most common form of eye inflammation. By the end of 2026, more than US$ 530 million worth of revenues are likely to be procured from treating anterior uveitis across the globe.